Wednesday night: Clear and comfy. 50s and low 60s. Thursday: Sunny and mild. Local sea breezes. Low 80s. Upper 70s coast. Friday: Mostly sunny. Low 80s. Upper 70s coast. 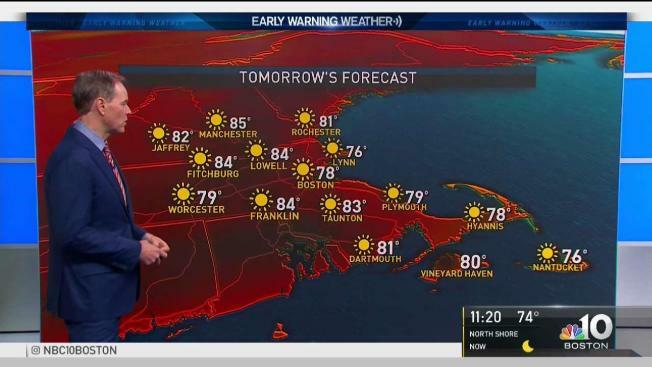 After the deluge Tuesday, sunshine and lower humidity is working its way into New England Wednesday. Highs will be in the low to middle 80s for most of the day as clouds clear and refreshing air will work its way into the area. Wednesday night will be refreshing with lows in the 50s and 60s for most areas. A few upper 40s will even sneak into Northern New England. Thursday and Friday will both be sunny and comfortable. Highs reach the 70s at the coast with a light sea breeze, but we’ll be in the 80s inland. Clouds will increase on Saturday as humidity will slowly pick up. Highs will again be in the 80s. Periods of rain will work its way on Sunday as it again becomes muggy. That muggy, showery stretch continues into next week. While it will be an unsettled pattern, not every day will be a total washout.